Our Abpromise guarantee covers the use of ab150073 in the following tested applications. ICC/IF image of ab6046 stained HeLa cells. The cells were 4% formaldehyde fixed (10 min), permeabilized with 0.1% Triton X-100 for 5 minutes and then incubated in 1% BSA / 10% normal donkey serum / 0.3M glycine in 0.1% PBS-Tween for 1h to block non-specific protein-protein interactions. 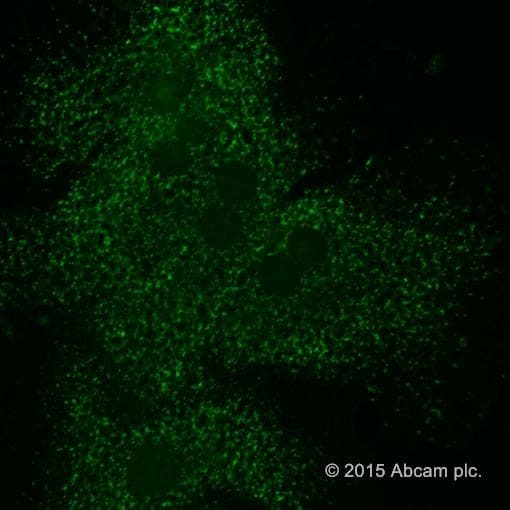 The cells were then incubated with the antibody (ab6046, 1µg/ml) overnight at +4°C. 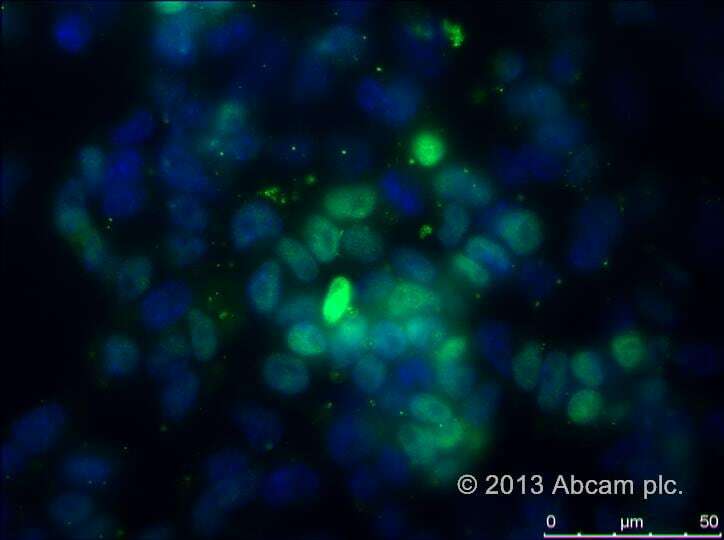 The secondary antibody (green) was ab150073 Alexa Fluor® 488 donkey anti-rabbit IgG (H+L) used at 1µg/ml for 1h. DAPI was used to stain the cell nuclei (blue) at a concentration of 1.43µM. This product also gave a positive signal under the same testing conditions in HeLa cells fixed with 4% formaldehyde (10min). Overlay histogram showing Jurkat cells stained with ab16669 (red line). The cells were fixed with 4% paraformaldehyde (10 min) and then permeabilized with 0.1% PBS-Tween for 20 min. The cells were then incubated in 1x PBS / 10% normal donkey serum / 0.3M glycine to block non-specific protein-protein interactions followed by the antibody (ab16669, 1/1000 dilution) for 30 min at 22°C. The secondary antibody Donkey anti-rabbit IgG H&L (Alexa Fluor® 488) (ab150073) was used at 1/4000 dilution for 30 min at 22°C. 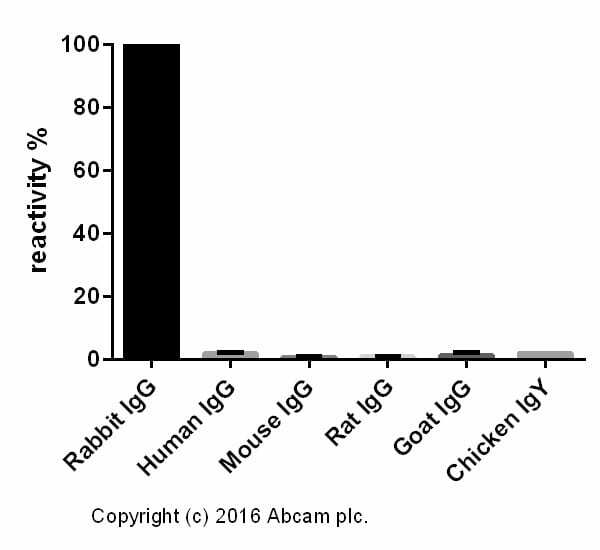 Isotype control antibody (black line) was rabbit IgG (monclonal) (0.1μg/1x106 cells) used under the same conditions. Unlabelled sample (blue line) was also used as a control. Acquisition of >5,000 events were collected using a 20mW Argon ion laser (488nm) and 525/30 bandpass filter. Cross-reactivity of the polyclonal secondary antibody ab182020 was tested using a sandwich ELISA approach. The wells were coated with the indicated IgG standards at 1 µg/ml (50 µl/well) and incubated overnight at 4°C, followed by a 5% BSA blocking step for 2h at RT. ab182020 was then added starting at 1 µg/ml and gradually diluted 1/4 (50 µl/well), followed by incubation for 2h. For the detection Goat anti-Donkey IgG H&L (HRP) (ab6988) was used at 1/20,000 dilution (50 µl/well), followed by incubation for 1h at RT. For the batch tested, ab182020 showed a cross-reactivity below 2% towards human IgG, mouse IgG, rat IgG, goat IgG and chicken IgY. 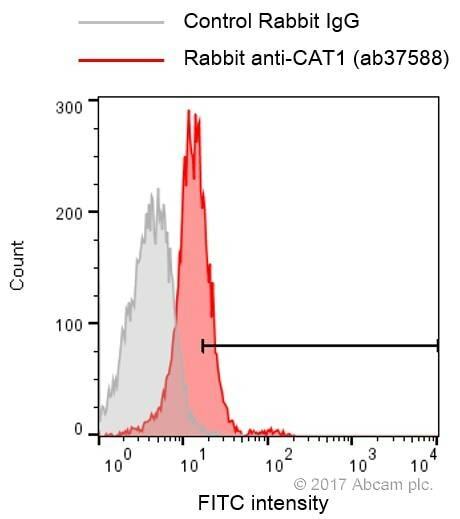 This data was developed using the unconjugated antibody (ab182020). Immunohistochemistry (Formalin/PFA-fixed paraffin-embedded sections) - Donkey Anti-Rabbit IgG H&L (Alexa Fluor® 488) (ab150073)This image is courtesy of an Abreview submitted by Laura Comley. ab104603 staining DYNLL1 in mouse cervical spinal cord tissue sections by Immunohistochemistry (IHC-P - paraformaldehyde-fixed, paraffin-embedded sections). Tissue was fixed with paraformaldehyde, permeabilized with 0.1% Triton X-100, and blocked with 10% serum for 1 hour at 21°C. Samples were incubated with primary antibody (2 µg/ml in PBS/10% serum/0.1% Triton X-100) for 16 hours at 4°C. 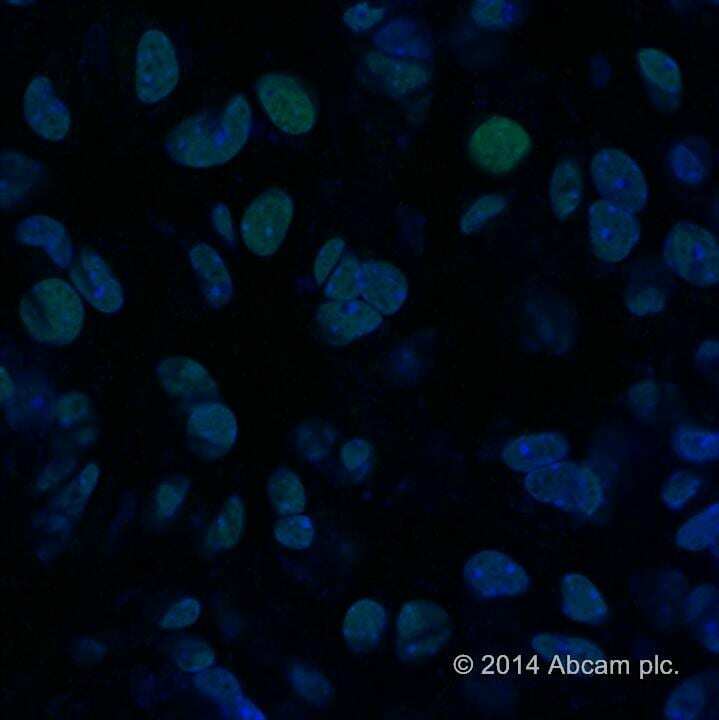 An Alexa Fluor® 488-conjugated Donkey anti-rabbit IgG H&L (ab150073) (1/500) was used as the secondary antibody. Publishing research using ab150073? Please let us know so that we can cite the reference in this datasheet. Result: CAT1 was specifically detected by FACS. immunofluorescent staining of iNOS in mouse hepatocytes. Donkey anti-Rabbit IgG H&L (Alexa Fluor® 488) is nice to label the iNOS in mouse hepatocytes. Human Nanog expression vector in WT mouse embryonic stem cells. Nice, bright clear staining seen using secondary antibody at a 1:200 dilution. Primary antibody used here was anti-Nanog (ab21624). Small amounts of speckled areas noted. Stained membrane to check for protein transfer, all looked good. Incubated in both primary and secondary antibody and imaged, no bands were present at any of the dilutions. Expression of pluripotency marker Sox-2 in human ES cells. Following fixation in 4% PFA, the cells were assessed for Sox2 expression using 1:100 dilution of the primary antibody (ab97959) in 1% serum, 0.1% triton, 0.1% BSA in PBS, followed by detection using donkey polyclonal rabbit IgG Alexa 488 (ab150073) at 1:500. The results show that nuclear Sox-2 (green) was clearly observed. 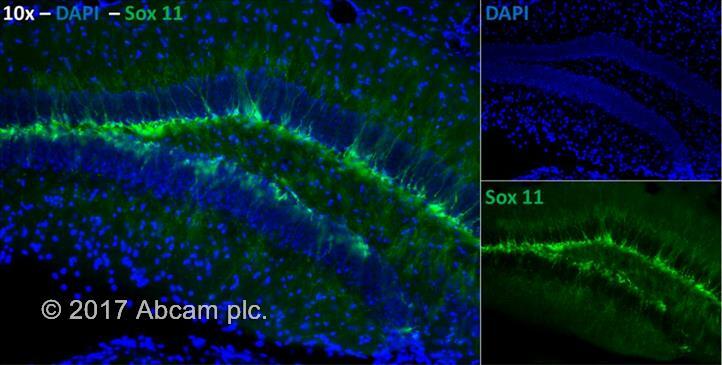 An isotype control IgG was run in parallel and showed no positive staining (not shown here). 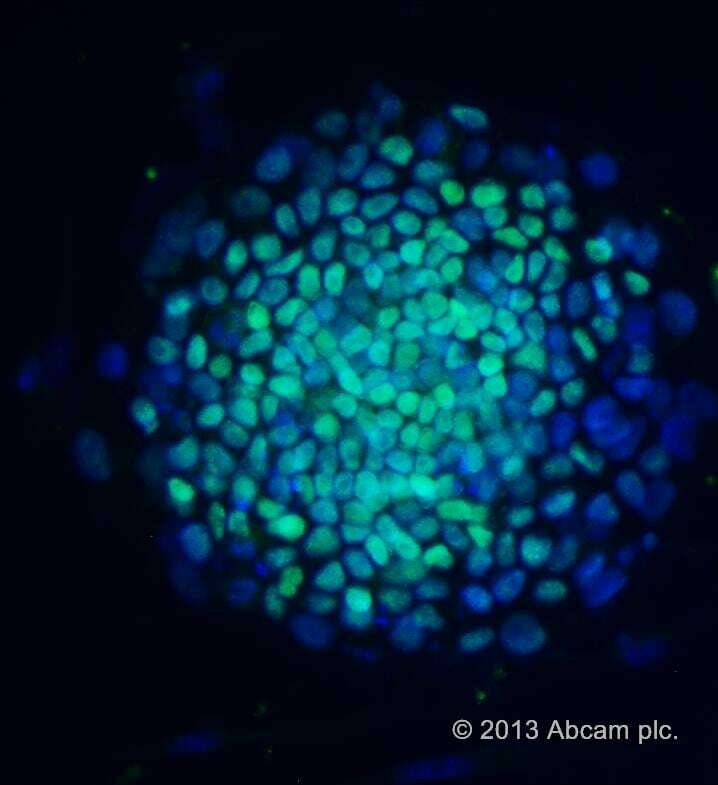 All nuclei were counterstained using DAPI (blue).